April 2016 Horoscope for Taurus predicts significant emotional turmoil in your life. Home and domestic affairs will dominate over career and profession. Spirituality and mental stability becomes vital. Family ethics and personal outlook will dominate the Bulls this month. In April 2016, Taurus, you decide the course of action to attain your goals and others have to follow suit. You are bristling with optimism and confidence. You create your own world. The end of the month will impact you strongly on the spiritual front. The Taurus personality, outlook and the way of thinking will become different. The Taurus 2016 April astrology predictions suggest that the first half of the month is good for making progress in your career. Important business decisions will take some time to materialize. The financial instinct of the Taureans is marvellous in April 2016 and you have very good financial perceptions. Your sound understanding of the financials and consequent actions will result in accumulation of wealth. All problems connected with monetary deals will be removed and money flow will be copious. This will help you in getting involved with philanthropic causes and you will be interested in religious discourses. The sixth sense of the Taurus zodiac sign will be excellent after the first week and your actions will confuse your love mates and friends. Progress in matters of romance will be tardy and singles will be specially affected by this. Your social skills are not that great and you should allow love to bloom slowly and naturally. People in permanent relationships will tie the knot or will review their partnerships. You can look for love online and in family circles. This is a good time to start planning for a child. The Taurus monthly forecasts show that health will be fabulous in April 2016. This will automatically assist you to improve your career prospects. Family relationships will be enhanced and your social confidence will be great. Do not ignore minor ailments and seek professional advice promptly or make use of natural home remedies. 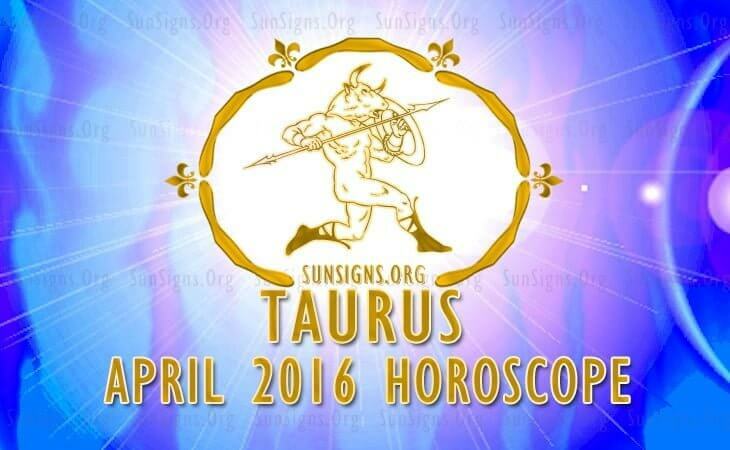 To conclude, the Taurus April 2016 horoscope foretells of a financially successful month.